The skin is the largest organ in the human body and is made up of three layers, the epidermis, dermis and the fat layer. The epidermis is the outer layer of skin that keeps vital fluids in and harmful bacteria out of the body. Severe damage to large areas of skin exposes the human organism to dehydration and infections that can result in death. Traditional ways of dealing with large losses of skin have been to use skin grafts from the patient or from an unrelated donor or a cadaver. The former approach has the disadvantage that there may not be enough skin available, while the latter suffers from the possibility of rejection or infection. The medical community has long been looking for a more dependable alternative. 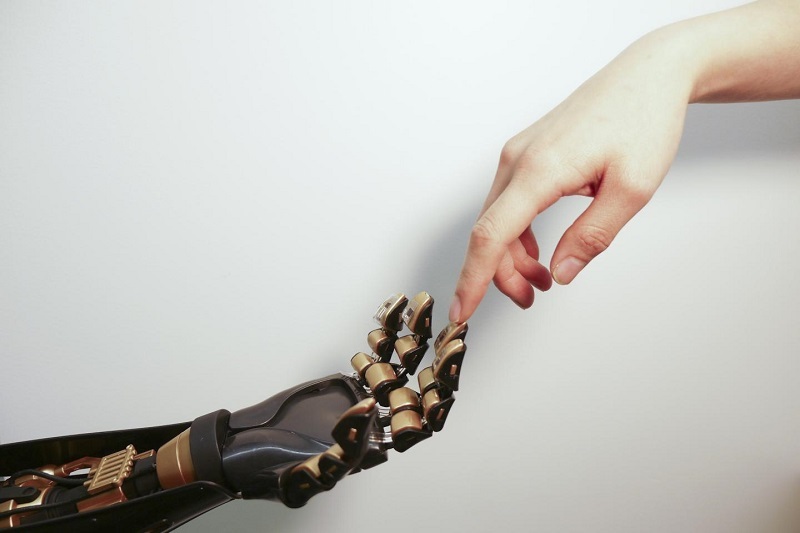 This is also a prerogative for researchers working to develop an artificial skin that senses touch, pressure, and moisture, and could be used to give prosthetic limbs feeling as well as having applications in deep cybernetics. Now, researchers at Stanford University state they have created an artificial skin that can detect how hard it is being pressed and generate an electric signal to deliver this sensory input directly to a living brain cell. The team state that this is the first time a flexible, skin-like material has been able to detect pressure and also transmit a signal to a component of the nervous system. The study is published in the journal Science. Earlier studies from the lab first described how to use plastics and rubbers as pressure sensors by measuring the natural springiness of their molecular structures. To exploit this pressure-sensing capability electronically, the team scattered billions of carbon nanotubes through the waffled plastic. Results showed that putting pressure on the plastic squeezes the nanotubes closer together and enables them to conduct electricity. In the current study the technique is a two-ply plastic construct, this allows the plastic sensor to mimic human skin which transmits pressure information as short pulses of electricity, similar to Morse code, to the brain. Increasing pressure on the waffled nanotubes squeezes them even closer together, allowing more electricity to flow through the sensor, sending short pulses to the sensing mechanism. Remove pressure, and the flow of pulses relaxes, indicating light touch. Remove all pressure and the pulses cease entirely. The current study hooked this pressure-sensing mechanism to the second ply of their artificial skin, a flexible electronic circuit that could carry pulses of electricity to nerve cells. Results show that the top layer creates a sensing mechanism and the bottom layer acts as the circuit to transport electrical signals and translate them into biochemical stimuli compatible with nerve cells. Data findings show that the top layer features a sensor that can detect pressure over the same range as human skin, from a light finger tap to a firm handshake. The lab explain that the current two-ply approach means that sensations can be added as new mechanisms are mapped. They go on to add that an inkjet printing fabrication process which they have developed suggests how a network of sensors could be deposited over a flexible layer and folded over a prosthetic hand. The researchers also had to prove that the electronic signal could be recognized by a biological neuron. They did this by using optogenetics and engineering a line of neurons to simulate a portion of the human nervous system. The group then translated the electronic pressure signals from the artificial skin into light pulses, which activated the neurons, proving that the artificial skin could generate a sensory output compatible with nerve cells. The lab note that optogenetics was only used as an experimental proof of concept and other methods of stimulating nerves are likely to be used in real prosthetic devices. Work has already begun to show that direct stimulation of neurons with electrical pulses is possible. The team surmise that there are six types of biological sensing mechanisms in the human hand, and their experiment reports success in just one of them. For the future, the researchers plan to develop different sensors to replicate, for instance, the ability to distinguish corduroy versus silk, or a cold glass of water from a hot cup of coffee. They go on to conclude that after spending many years on this work, they can now see a clear path to take their artificial skin. Human finger touches robotic finger. The transparent plastic and black device on the golden “fingertip” is the skin-like sensor developed by Stanford engineers. This sensor can detect pressure and transmit that touch sensation to a nerve cell. The goal is to create artificial skin, studded with many such miniaturized sensors, to give prosthetic appendages some of the sensory capabilities of human skin. Credit: Bao La.